Fujian Province is called "Min" for short. Fujian Cuisine has a time-honored history, with a strong local flavor of south China. Fuzhou Cuisine, a main component part of Fujian Cuisine, is popular not only in Fuzhou, but also in east, central and north Fujian Province. Chefs of Fujian Province are good at preparing delicacies from land and sea, and local dishes feature clear, delicious and mellow tastes and a delicate smell. The cooking techniques of Fujian Cuisine have the following characteristics: 1.Chefs are skilled in the use of a kitchen knife, full of interest. 2. 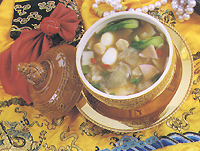 The Fujian people are peculiar about soup, which is full of changes. 3. A wide variety of seasonings are used, with unique characteristics. 4. Dishes are meticulously prepared, refined and graceful. Fujian Cuisine is characterized by clear, refreshing, delicious and light tastes, slightly sweet and sour. Typical famous dishes: Monk Jumps over Wall, sea clams in Chicken Soup, Glossy Ganoderma and Jade Cicadas, Litchi Pulp, Fragrant Sliced Snails with a Faint Smell of Distillers' Grains, Jadeite Pearl Abalone, Chicken with Distillers' Grains, etc. Famous snacks: Fried Oyster, Lightly Fried Dumpling, Clam Cakes, ThousandLayer Cake, Meat Balls, Taiji Smashed Taro. With a history of over 100 years, Monk Jumps over Wall is prepared with more than 20 ingredients, such as chicken, duck, pig's trotters and mutton, and stewed over a low fire with a jar for holding Shaoxing wine. Whenever this dish is served, the whole restaurant will be full of aromas. In the past a scholar composed a poem, saying: "All the neighbors enjoy pleasant aromas when the dish is served; and even a Buddha who is attracted by the smell jumps over the wall." Hence the name. This nutritious dish is noted for clear soup, white and tender meat, and a refreshing and delicious taste. Beautifully shaped, this dish is meticulously prepared, with excellent colors, smell and taste. In the shape of litchis, this dish is crisp, tender, sour, sweet and tasty. It is refined, smooth, refreshing, aromatic and sweet. Light red in color, sliced snails are tender and crisp, with a aromatic smell of distillers' grains. Soft and sweet, the thousand-layer cake is oily, but not greasy. This cake features crisp and fragrant skin, delicious stuffing and a golden yellow color.